Situated in Mapusa, this hotel is 1.8 mi (3 km) from St. Xaviers College and within 6 mi (10 km) of St. Michael's Church and Miraculous Cross. Candolim Beach and Vagator Beach are also within 9 mi (15 km). Located in Mapusa, this family-friendly property is 1.9 mi (3 km) from St. Xaviers College, and within 6 mi (10 km) of Splashdown Waterpark and St. Michael's Church. Miraculous Cross and Mae De Deus Church are also within 6 mi (10 km). 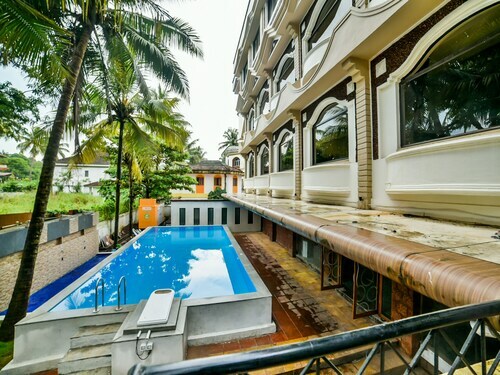 Located in the heart of Mapusa, this hotel is 0.9 mi (1.4 km) from St. Xaviers College and within 6 mi (10 km) of Calangute Beach and Candolim Beach. Vagator Beach and Baga Beach are also within 6 mi (10 km). Situated in Mapusa, this motel is 1 mi (1.6 km) from St. Xaviers College and within 6 mi (10 km) of Saturday Night Market and St. Michael's Church. Mae De Deus Church and Miraculous Cross are also within 6 mi (10 km). How Much is a Hotel Room in Mapusa? Hotels in Mapusa start at $20 per night. Prices and availability subject to change. Additional terms may apply. Mapusa has a terrific range of comfortable accommodation possibilities to select from. Thanks to our handy database, you'll discover 382 apartments and hotels within a 6-mile (10-kilometer) radius of the center of Mapusa. For the times when you are booking a base that is just a short stroll from the urban core of Mapusa, La Mansion Goa and Hotel Mayura would be perfect. 4 miles (6 kilometers) outside of the center of Mapusa, you will come across the Nilaya Hermitage. The Joie De Vivre Goa can be found 4 miles (7 kilometers) away. The Goa Marriott Resort & Spa along with the Vivanta by Taj - Fort Aguada, Goa are two more Travelocity-listed places to book accommodation in Mapusa. After spending time in Mapusa, you should leave time to unveil the other cultural and scenic attractions of the West India area. West India has beaches and coastal plains, and other interesting visitor destinations are ruins, old towns and fortresses. In this region of India adventurous travelers may try their hand at hiking, caving and cycling. 7 miles (11 kilometers) from Mapusa, you will reach Candolim, which boasts Candolim Beach and Fort Aguada. The Vivanta by Taj - vacation Village, Goa and Fahrenheit Hotel are just some of the convenient apartment and hotel options in Candolim. Or, you could stay the night in Panaji, 8 miles (13 kilometers) to the south of Mapusa, where you'll find the Grand Hyatt Goa and Cidade de Goa. The Church of Our Lady of Immaculate Conception and Casino Royale are a couple of the popular places to get to know when you're in Panaji. Before saying your farewells to Goa, ensure you see some sport. Stop by Fatorda Stadium, found southeast of Mapusa. Visitors who would like the ease of booking a hotel nearby, book a room in the Joecons Beach Resort or Baywatch Resort. 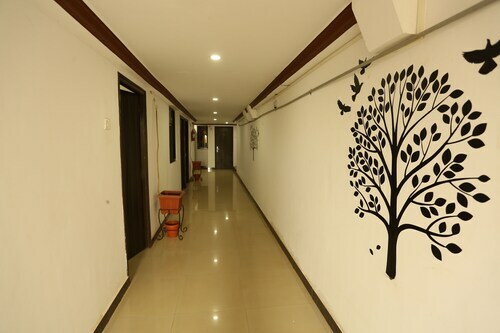 If you are traveling via Dabolim Airport, you might like to book Travelocity-listed rooms at Devasthali - The Valley of Gods, or The HQ, which are both a short taxi ride away. 5.0 Hotel is 500 feet from the beach, wonderful staff. It rained the first two days we were at the hotel. They provided rides in golf carts and umbrellas. The pool is great. The kid's activities are good. The staff is very friendly, especially after you've been there a few days, and they recognize you. 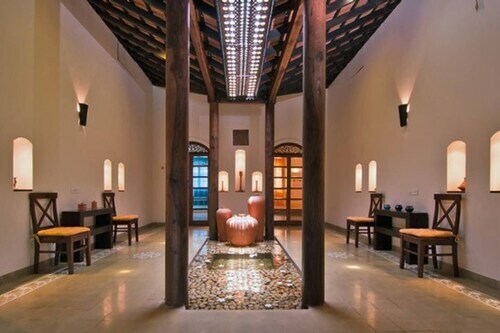 The spa is terrific and a good value. \nThe downsides are: \n- You have to take a courtesy car to the Ft. Aquada hotel down the road to use the fitness center or spa. \n- The food is very expensive. Expect to pay NY prices. That's the only real downside, because its excellent. \n- There's no beach. It's been washed away along with a good part of the cliff.